Do you use task cards in your classroom? Do you know what they are? It is so easy to get confused with all the terminology coming out about current trends in the classrooms. Sometimes, I'll look into a current trend and realize I used it in my classroom, but called it something different. Brag tags, tasks cards, interactive notebooks, STEM...just a few of the current trends in education that you may call something different in your classroom. Let's take a look at task cards today so I can help you see what they are, how they are used and hopefully give you some ideas of how you could use them in your classroom. A task card is a series of questions/problems/tasks that are broken down and usually only include one per card. I like to describe it as a worksheet where you took each question and put it on its own card. Now, I say worksheet but that doesn't mean that a task card has to be boring or lower level thinking. That is actually the beauty of task cards. They can work for any level (yes seriously a preschooler can do them but so can a college student) and include many types of questions such as multiple choice, short answer or fill in the blank. Here are some Frequently Asked Questions about task cards. Do you have the same questions?? Do I need technology to use them? Nope, you sure don't. At the most basic level, you have the cards and then you have a recording sheet where students can write the answers down. Now, there are versions that involve technology. A fun way to do this is to add a QR code to the card. This allows a student to answer the question and then use a device (iPad, tablet or phone) to scan the code to check their answer. 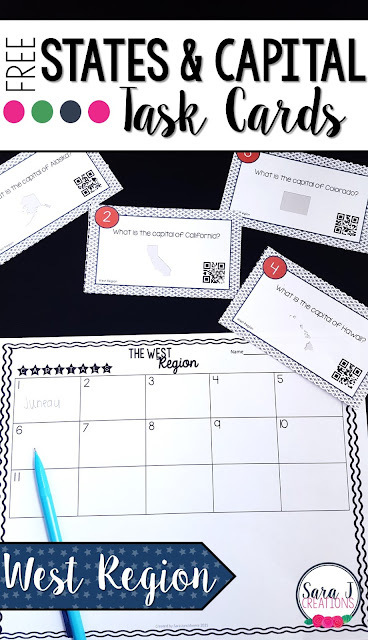 This is a nice option because it adds engagement because of the use of technology, but it also makes the activity a self checking activity, which means students get instant feedback about their answers. That being said, it isn't required to use technology and most cards that include QR codes can be used without scanning the codes to check the answer. Why don't I just give my students a worksheet instead? One of my favorite reasons for using a task card, is that it allows you to differentiate for your students. Based on the questions on the cards and the skill level of your students, you can assign certain cards to certain students. Or you could even assign a certain amount of cards to be completed. That way, a struggling student who would be overwhelmed with looking at an entire worksheet of problems, has a more manageable assignment when you tell them to complete 5 cards. Now they can focus on just one problem at a time. Is this just a math resource? No, task cards work for any subject area. It definitely makes a great math center but it can easily be used in any subject area. Can I turn it into a game? Yes! There are lots of ways to use task cards in the classroom. One way to make it a whole class game is to play Scoot. Put a task card at each student's desk. Give your students a recording sheet and pencil. Set a timer and have everyone solve the card at his/her desk. When the timer goes off, they move to the next desk and solve that problem. They continue moving from desk to desk until they have solved all the task cards. Another idea for a game would be a "beat the clock" game. 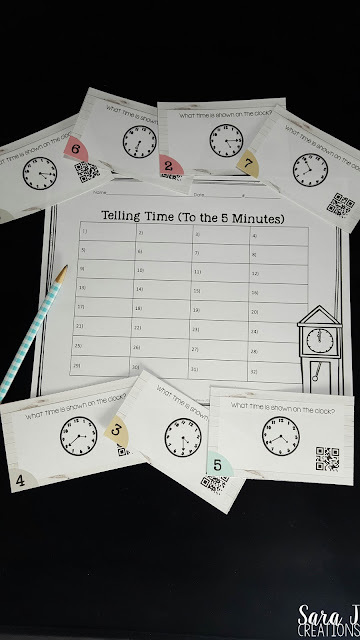 Set the timer and have students move around the room trying to solve as many task cards as they can before the timer goes off. Student with the most correct answers wins. Is there movement involved or do they work on task cards at their desks? Completely up to you! If you want some movement, you can tape task cards around the room. Students can grab a recording sheet and clipboard and "wander" the room looking for cards. When they find one, they solve it, write the answer down on the recording sheet, and keep searching for another card. You can also have students just stay at a desk or table and work on a stack of task cards. Are task cards only for practicing a skill you've already taught? No, you can use task cards in so many different ways! It could be a pre-assessment activity to see what your students know before you start the unit. Then you can use those results to group them in small groups with students who have similar needs. You could also use them as review after you've taught a concept. You could try them as an assessment. Instead of a big scary test on the unit you just taught, have them use task cards to show what they know. A set of task cards, a recording sheet and a pencil. If you want to just use one set of cards for the class and reuse them each year, I would suggest laminating for durability. If you want students to be able to write on the cards or glue them into a math journal for example, print enough cards for the whole class. What are other ways you could use task cards? How do I store task cards? Can I try some task cards to see if I like them? If you want to give task cards a try, but don't want to create your own or buy them if you aren't sure if they will work for your students, grab a freebie. I have my place value task cards sample available as a freebie for lower elementary students. They focus on expanded form, word form, place value blocks, comparing numbers and more. For older students, I have states and capitals task cards. I have a free sample of the states in the western region. This set has a QR code on each card to have students check answers, but you can use them without the QR code if you want. What is your favorite way to use task cards? Do you have a trick for storing them? I'd love to hear about how you use task cards!